Rasathanthram is a 2006 Malayalam drama movie directed by Sathyan Anthikkad. It had Mohanlal and Meera Jasmine as lead pair. 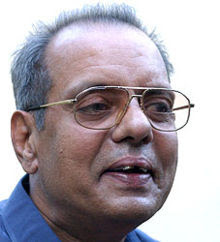 Other actors include Bharath Gopi, KPAC Lalitha, Innocent, Oduvil Unnikrishnan, Mamukkoya and others. Director Sathyan Anthikkad got the Mathrubhumi best director award for this film. Maestro Ilayaraja scored the Music. 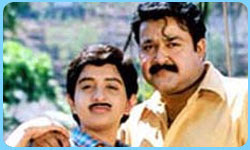 Premachandaran,(Mohanlal) is a carpenter with a few secrets and lives along with his father Balan Master(Bharath Gopi) and works along with his friend Manikandan (Innocent). They are now working in a house near the house of a rich landlord. Kanmani (Meera Jasmine), who was sold by her mother works in that house as a servant and is ill-treated. Seethamma (KPAC Lalitha) lives along with her daughter Kumari (Muthumani) who has a liking towards Premachandran. One night, Premachandran goes to his workplace to take his tools. He sees Kanmani moving out of the house and gets puzzled. He follows her. She was on the verge on committing suicide and Premachandran rescues. He gives her shelter in one room in a building owned by Chettiyar (Oduvil Unnikrishnan) telling Chettiyar that his friend did not get the bus to go back home. Kanmani dresses up as a boy by the name of Velayithunkutty and soon starts working with Manikandan & Premachandran. Balan Master starts liking the disguised boy. One day, Premachandran tells Kanmani that he hs made a plan to rescue Kanmani by sending her to Tamil Nadu to work in a banian company where Premachandran's friend is working. Kanmani refueses to go. Premachandran accidentally confesses to Manikandan that Velayithunkutty is the actual Kanmani missing. Manikandan has no peace and shouts out the truth in the middle of the night. Two policemen, accidentally hear this and take Premachandran & Kanmani to custody. In the court Kanmani tells that she is in love with Premachandran and was going to elope, to escape from the bars. Soon, Kanmani starts developing an affection towards Premachandran. Premachandran tells her that she doesn't know anything about her and was an ex-convict in a murder case. Actually, Premachandran's friend Sivan murdered a hooligan who abused Premachandran's sister. Kanmani, now agrees to go to Tamil Nadu. But, Premachandran, doesnt lt go and gets her admitted in a hostel. Premachandran's brother, Siddique comes to the fray and asks Balan Master to attend his daughter's marriage. He asks Premachandran not to come. Actually, Balan Mash & Premachandran are living far away from home because of the bad nature shown by Premachandran's brother and sister. Balan Master is not willing to go but Premachandran who loves his niece as his daughter changes Balan Master's mind. On returning, they see their rented house being destroyed. Balan Master takes shelter in a old age home headed by a Colonel until a new house was rented. 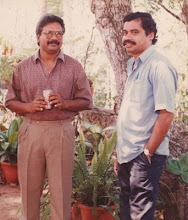 Premachandran goes to Kochi to meet Sivan, (Mukesh) who was the actual murderer. He is now a business tycoon. But, Sivan doesnt meet Premachandran's needs. On returning, Premachandran finds ou that Balan Master is dead. He does the ceremonial rites and goes to Kanmani, Meanwhile, Kanmani's so called uncle, played by Jagathty Sreekumar who wants to marry Kanmani & Jagathy's sister gets court orders to take back Kanmani to Tamil Nadu. But, Premachandran grabs the thali mala from Jagathy and ties the knot on Kanmani and gets her married. Ammana thumbi koode poroo poroo..